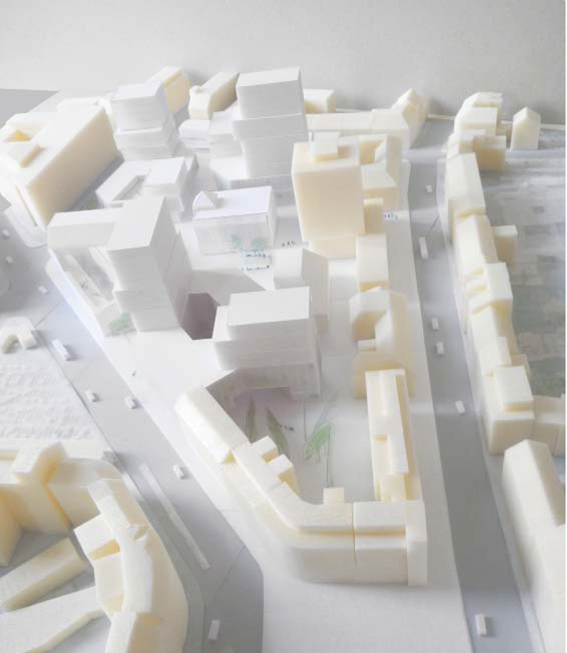 Design proposal for Badel block development identifies the complex urban dynamic of the wider Zagreb downtown area. 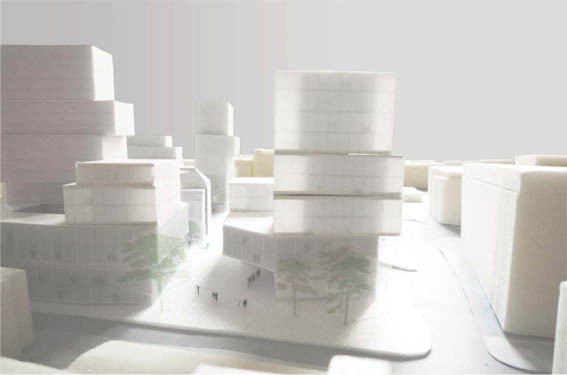 The project continues to foster this dynamic through operative architectural scenarios, the use of multiple urban typologies and succession of open public spaces. 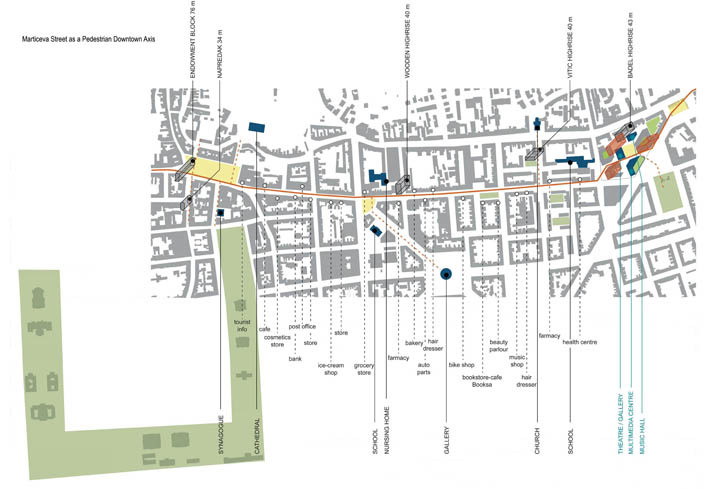 The concept recognizes the location of Badel block within the lively hybrid neighbourhood of Kvaternik Square, as well as its proximity to the social and cultural nucleus of the Lower Town on the west. Marticeva street, which connects Kvaternik Square area and the downtown centre is seen as a prospective pedestrian axis on account of its slow traffic and existing public infrastructure. 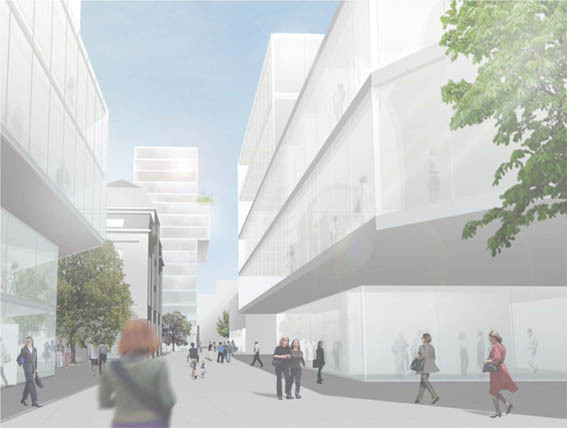 The new urban value of Badel block development, which becomes a link between Marticeva Street and Kvaternik Square, is expected to activate Marticeva and enhance its potential as a pedestrian connection. 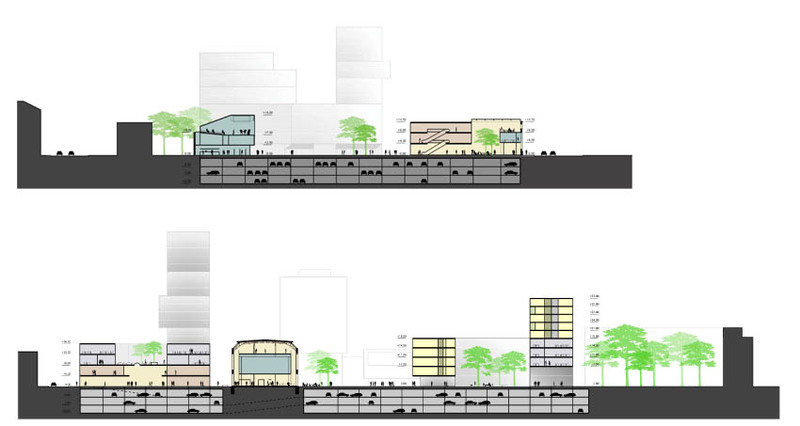 The proposed concept for Badel block design is seen as the focal point of this amended public axis. The axis is therefore directed to pass through the block, which enriches it with new amenities and averts it from the busy intersection on Subiceva Street. 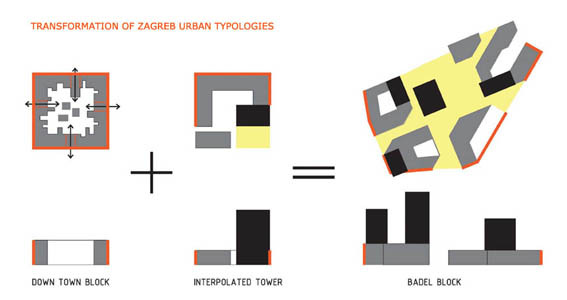 The morphology of Badel block proposal is based on existing Zagreb downtown typologies: urban block and it`s later transformations (interpolation & extrapolation). 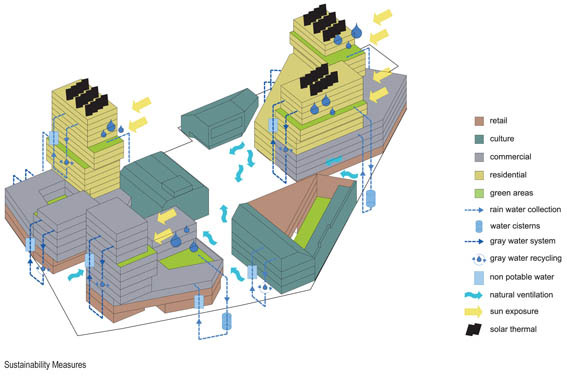 These typologies are being transformed and adjusted to the Badel block context in order to outline the new urban value. 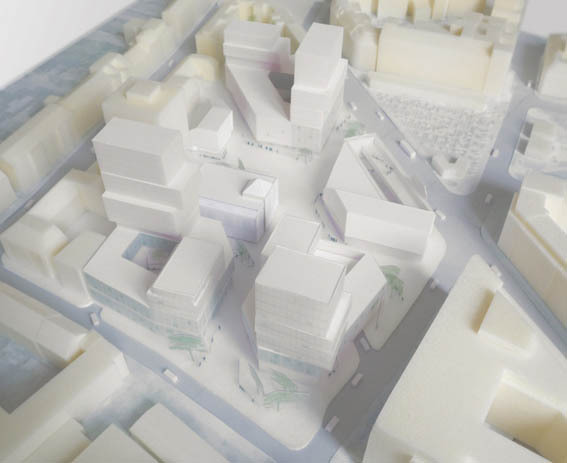 A complex of tailored horizontal bases is juxtaposed with towers on top of them, the scale and orientation of which is determined in regards to the urban matrix of Zagreb downtown and its perimeter. Instead of being shaped as one central square, Badel block open spaces are organized as a series of smaller activity pockets of different character and type. This concept continues the Kvaternik area typology, which is a hybrid of a residential and a commercial neighbourhood based on the heterogeneous morphology. 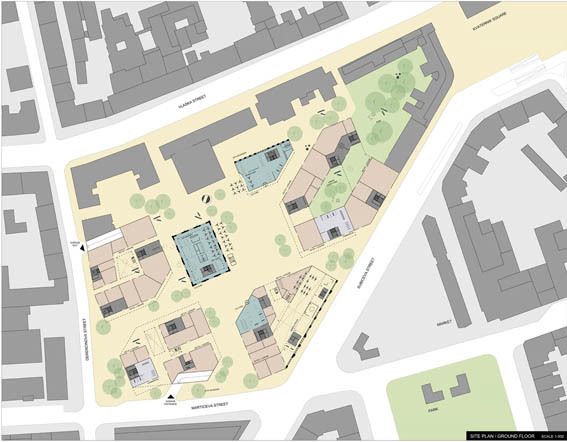 A positive outdoor space within the block is generated as a sequence of squares suitable for various social groups and a wide range of different activities. The size and orientation of these squares enable for enhanced sun exposure and natural ventilation of exterior and interior spaces. 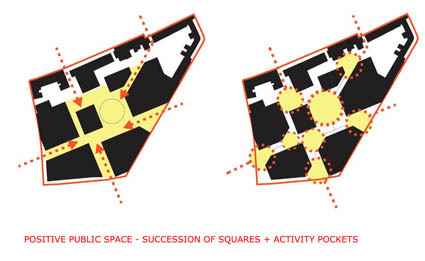 The public space is proportioned both to human scale and to the scale of the urban matrix of the neighbourhood. Sustainability is treated as a holistic set of processes. The goal of the design is to achieve sustainability on social, cultural, environmental and economic level. 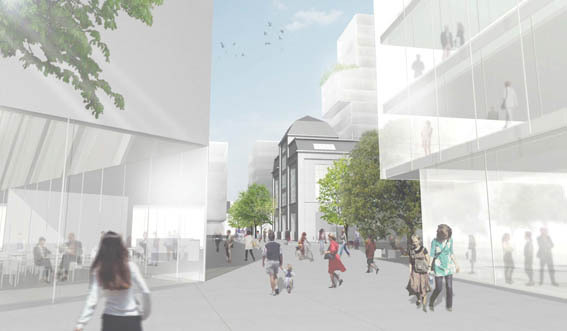 Social sustainability measures include inclusive housing programs, combination of different uses throughout the site, accessible cultural amenities for various users, different typologies of retail which support local tradition, public and commercial uses which facilitate Badel block and the neighbouring area. Cultural sustainability is fostered by respecting the tradition, at the same time allowing for contextual and contemporary interventions. 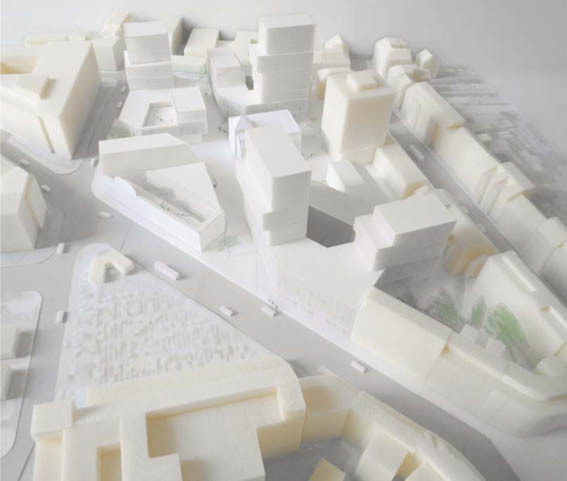 Zagreb’s urban matrix and the tradition of the city block are the main premise of the design proposal, but that morphology is being adjusted to the context of the site and the design assignment. On a smaller scale, cultural aspect of sustainability is in the treatment of heritage buildings, and in their reuse for prominent public programs. The measures of environmental sustainability are being applied through the building orientation and location of open spaces in order to achieve favourable sun exposure and natural ventilation of exterior and interior spaces. Buildings on the south are lower to allow the sun to reach structures on the north. Implemented green roofs reduce the heat island effect, collect and filter rain water, which is being re-used for non-potable purposes. Permeable surfaces enable stormwater absorption and filtering, and reduce the risk of flooding. The ratio of uses, the potential manipulation of BRP, different typologies and possible interaction of programs contribute to the economic aspects of sustainability.